In some situations, the number of actually managed objects may exceed the license limit. For example, this may happen when some VMs or hosts are temporarily managed for testing or POC. If the license limit is exceeded by no more than the specified percentage, Veeam ONE continues to manage all objects. If the license limit is exceeded by more than the specified percentage, all objects exceeding the licensed number and the allowed increase are excluded from monitoring and reporting. To determine what objects to manage, Veeam ONE uses the last-in first-out method (LIFO): objects that were discovered last are removed first from the monitoring and reporting scope. An increase in the number of managed objects up to the specified percentage is allowed only for a limited period of time. The duration of this grace period is equal to the duration of the license key. By the end of the grace period, you must update the existing license or decrease the number of managed objects. Otherwise, Veeam ONE will exclude from monitoring and reporting objects that exceed the license limit. VMs are excluded with the help of an automatic exclusion rule that is created by Veeam ONE. You can review VMs covered by this rule in Veeam ONE server settings. For details, see Choosing VMs and VM Containers to Monitor and Report On. If you exceed the number of monitored computers with installed Veeam Agents and VMs protected on monitored Veeam Backup & Replication servers, Veeam ONE will not exclude any objects from monitoring or reporting. For objects that exceed the license limit, Reporter will generate reports with the Veeam watermark. In addition to managing objects that exceed the license limit by no more than the specified percentage, Veeam ONE allows you to monitor any number of new objects (that is, objects that are monitored for the first time in the current month). Exceed by new objects is supported for Rental licenses only. 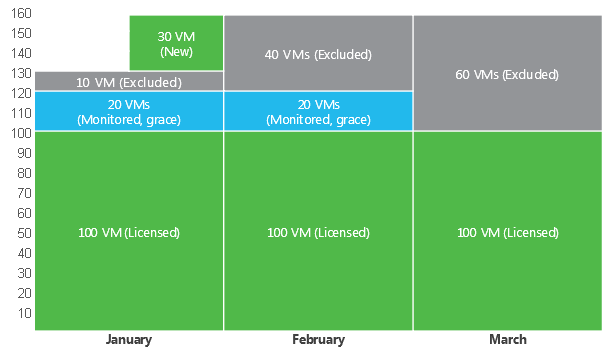 Consider the following example: at the beginning of January the number of VMs is 130, while a license covers 100 VMs. The period for exceeding the license limit is 60 days. Within the first 60 days (in January and February), Veeam ONE will manage 100 + 20 VMs that were discovered first (license limit + 20%). 10 VMs that were discovered last will be excluded from monitoring and reporting. In addition, in the middle of January, Veeam ONE discovers 30 new VMs. Veeam ONE will manage these VMs until the end of the month. For per-socket licenses, Veeam ONE does not offer any grace period. If the number of sockets exceeds the license limit, Veeam ONE will exclude from monitoring and reporting hosts above the license limit.